When people drive up to your home, what's the first thing they see? 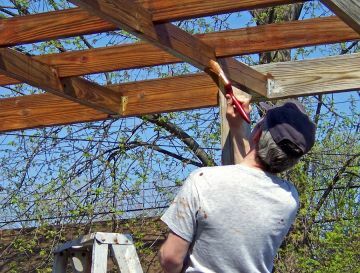 If you have a deck, front porch or exterior fence that needs repairs, the answer is simple: your deck and fencing. If you are looking for a local painting contractor to spruce up your home's exterior accents, call the experts at Palmer Pro. If the rest of your home is beautiful and well-maintained, damaged fences and decks can diminish the entire look and feel of your property. Fortunately, you don't have to live with it forever. By hiring Palmer Pro to improve your deck and fence, you can enjoy beautiful grounds and you won't need to lift a finger (just the phone!) Call (832) 410-1868 for a free, no obligation quote. Careful work. When you work with Palmer Pro, you can count on professional preparation, clean lines and careful work. We're not sloppy, and we won't splatter your property with paint. All shrubs and furnishings will be covered and protected. Work with professionals. Palmer Pro's painters are professional, reliable and expertly trained. You can trust us to treat your deck painting job like we'd treat our own jobs.